Where can you train silks? It is not that easy to find silk classes for adults, although many are available for children. Studio Ad Astra has been training and performing in silks since 2004, with many performances and organised workshops. During a workshop we work on the moves with safety always in mind, everybody can work at his/her own speed. Want to try? Gather your friends and book a workshop, or check the next course. 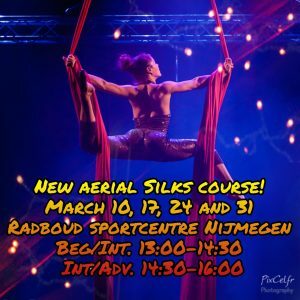 Studio Ad Astra organises short aerial silks courses. During each courses we will work on basic techniques like climbing, footlocks and basis poses. 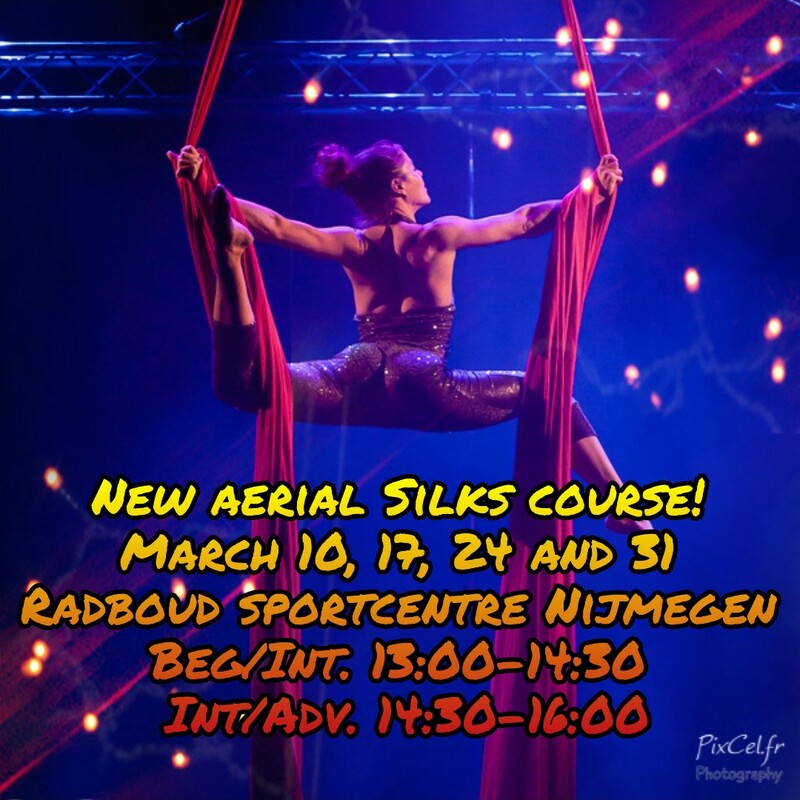 –>The next silks course is planned the sundays in March, 10, 17, 24 and 31st of March 2019. For more details see under “Agenda”. Wanna stay in touch? Send an email to info@studio-adastra.nl to receive our newsletter. Silks can cause nasty friction burns on bare skin, therefore, we advise that participants always wear long sleeves and long, thight pants. A gymnastics leotard and leggings are appropriate. We also advise participants to wear gymnastics shoes or to train barefoot as outdoor shoes/trainers are not allowed in the gym. Long hair should be tied in a ponytail. Importantly, all clothing must be free from zips and anything that might catch and damage the fabric.